Chaucer and I have been reading The Yearling. 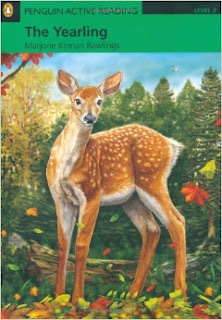 I started it before going to Lake Burton, but Jody hadn't yet found the fawn, so neither Chaucer nor I were hooked yet. But I picked it back up when I got home, and Flag made his appearance soon afterward. It was a cold, bright night, perfect for nestling down under a fleece throw with a good book. Chaucer was stretched out along the end of the bed, warming my feet and keeping me company. When I finished the chapter, I closed my iPad and lay beside him. I stroked his ears and the crown of his head, and told him about the baby deer. He's the same color as you, and just as soft. I understood the boy's delight completely. Any animal lover would. Chaucer could live a hundred years and I'd never get over my joy and wonder at getting to care for him, hold him, play with him. I've been Jody in a million other lifetimes. And in this lifetime, Chaucer is my Flag. Later, I told Chaucer about the hunts. About Ol' Slewfoot, and the bravery of Julia and Rip, the dogs who would eventually bring him down. He especially liked the parts about the hounds scenting their prey, and Penny's skill at tracking game through the wilderness. I told him about all the animals on Baxter's Island - the varmints and "creeturs", big and small. He blinked at me and I pictured him in another world completely: the scrublands of northern Florida, trusty guard dog of humble country folk some three-quarters of a century ago. Would he love that life more than the one I've given him? Maybe. Would he have been loved more? Impossible. Tonight Terence and I walked him to Grand Park, which a pretty good trek for him these days. He started to lose steam about where he always does, hanging his head and panting hard. We saw a small black cat on the walk ahead of us, poised to dash off into the bushes. Knowing she'd easily get away, knowing Chaucer can barely catch his own shadow, I unclipped his leash. He tensed up, understanding, waiting for my direction. I knelt down beside him and pointed. "Kitty, Chauc!" I whispered, and he was off like a shot. The cat was gone in an instant, and Chaucer, as usual, stood helplessly at the edge of the brush she'd disappeared into. Normally at this point he walks back to me, sheepishly defeated, to be clipped back into his leash. But tonight when he heard my laughing "Good boy!" he did something neither Terence nor I expected, nor could believe afterward. He clambered onward, into brambling bushes that came up to his shoulder. Bushes even a true hound dog would have trouble navigating. He scrambled for footing, peering over the top of the greenery as he tried to find the cat. Alarmed he might trip and hurt himself, we quickly called him back. Terence and I frowned at one another, amazed. So, so unlike him to do that. "He's trying to impress me," I joked. "He knows I'm reading The Yearling with all these hunting dog scenes, and he's trying to prove he's a good hunter, too." Not five minutes later we were further up in the park, in a wide, grassy area divided by landscaped cement partitions. Terence spotted a small dark shape silhouetted one on of the partitions. At first we thought it was a cat, but it was slinky and crouched-down, and I gaped in horror at what I assumed was a massive rat. "It's a possum!" said Terence, who with better eyes could make it out clearly. Scared Chaucer would give chase and get himself god knows what disease, I handed off the leash so I could inch closer alone. I'd never seen a possum in the wild. Again, it was like something from The Yearling. Chaucer caught the animal's scent and pulled forward. He sensed my excitement and strained at his leash to see. The possum had crawled along the low wall and frozen. He was playing dead. We snapped a quick, blurry photo more to briefly illuminate it than anything and then moved on, happy that Chaucer got to smell something new and exotic. About an hour ago, Chaucer long since having ditched me in the chilly living room for the warmth of his bed, I finished the novel. The final twenty pages devastated me; I cried three times. Just as surely as I know some of Updike's passages are the best fiction I've ever read, the final paragraph of The Yearling is the best ending I have ever read. It took my breath away and I had to clasp my hand over my mouth, to stifle the sobs. It's a paragraph to launch the writing careers of a thousand would-be novelists. Raw and unforgettable and perfect. I don't have any discussion questions this time around. I have only awe. And my Flag to go cuddle.